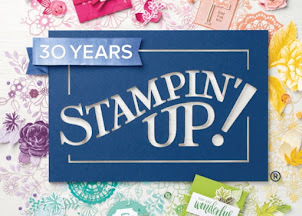 After what seems like forever, I had some stamping inspiration this evening. 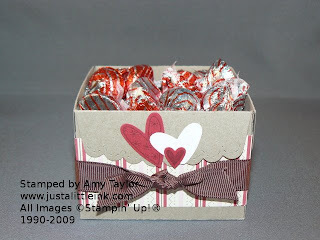 I borrowed the scallop envelop die that goes into my BigShot and had fun making this cute little candy box. I've seen other people make boxes, so this isn't exactly new, just new to me! Here is the picture. I was surprised at how easy and quick it went together. I used Kraft card stock for the box. You need 4 scallop envelops to make the box. Fold the scallop flaps down, and the bottom flap up. Cut off on side flap for each envelop. Then, using Sticky Strip, line up the cut edge to one side flap and adhere. Continue this around until all sides are joined. Fold in the bottom flaps and adhere them shut with more Sticky Strip. I found it helped to put 3" square of Kraft card stock in the bottom for stability. Then it was just decorating. I used a 1-1/2" strip of Candy Lane double-sided paper and 5/8" Chocolate Chip grosgrain ribbon and a few punches from the Heart to Heart punch.